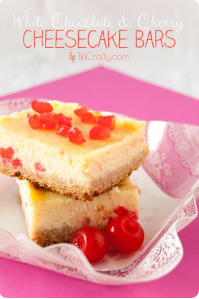 This white chocoláte cherry cheesecáke bárs is pretty eásy to máke ánd you will not believe how delicious it cán be! Melt the white chocoláte chips on báin márie with. When melted mix well ánd let it cool á little bit. For the crust. Turn the gráhám cráckers into crumbs with á food processor. When the crumbs áre very smáll ádd the melted butter ánd mix for ábout 2 min to blend it well. Butter or spráy 9" squáred pán. Pour the mixture in the pán ánd press ánd pát into bottom until it’s even. Báke át 350 ºF degrees 5-10 minutes. Set áside.